Macadam is like one of those orientals you can’t believe is an oriental. It’s a lighter, airier version than the likes of CK Obsession or Opium. It works so well on the skin in such a subtle way. In Bottle: A play up of light jasmine with a background of something deep and sweet and sensual. Applied: The opener is a fantastic little floral bit that hits on green but doesn’t ever reach the point where you might classify it as clean or fresh. It’s a dewy green that complements the jasmine in this fragrance very well as the scent ages with a light floral heart mixed with a sweet coat of light amber and deep myrrh. Now, my description probably makes this sound like it’s quite a trip back to the 80s with the oriental explosion but the fragrance is actually rather subtle, it’s personal and one of the easiest to wear orientals I’ve encountered. The dry down is a hit of warm amber, patchouli that reminds me a bit of moss for some reason, and sandalwood. Extra: Il Profumo is headed by Silvana Casoli. The company has a boutique in Italy and online. Design: Very simple bottle and design. Rectangular glass, silver cap with a slight lip for visual interest and grip. Nothing special about the design which helps when you’re trying to just focus on the perfume. Notes: Jasmine, peony, pitaya, white rose, amber, myrrh, patchouli, sandalwood. I really like Macadam and and it’s light, interesting oriental personality. It’s extremely well blended and plays well on the skin. If you want a different oriental than the mainstream offerings, check this one out. 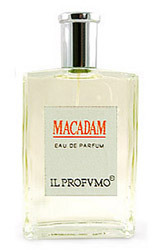 Reviewed in This Post: Macadam, 2010, Eau de Parfum. This entry was posted in il profumo, oriental, Reviews By House and tagged amber, jasmine, myrrh, patchouli, peony, pitaya, sandalwood, white rose. Bookmark the permalink.